I forgot to mention another highlight of the last seven days. While sewing one afternoon, a flash of bright color through the window caught my eye. It took me a few seconds to find the source of that flash, but it was worth abandoning my quilting for a bit. I saw a brilliantly colored bird dive into the filbert (hazelnut) tree about 20 feet away. The bright yellow body, black and white wings and red-orange head made me think some tropical pet had escaped a birdcage, but as I watched several more appeared, all flying at breakneck speed between the filbert tree and a tall viburnum (snowball bush) only 10 feet apart. The sun happened to be shining just then, making their colors even more brilliant. It was impossible to count how many there were as they moved so fast, but I'm guessing 8-10 - enough to know that they weren't escaped pets. All too soon, the birds flew northwest out of my field of vision and the show was over. The rain was pouring again within 5 minutes, so I hope the little creatures had reached a safe place by then. 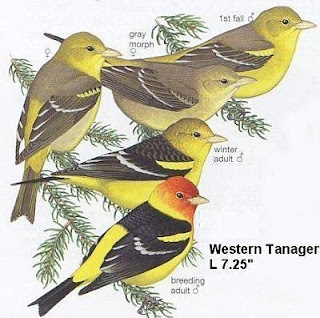 Later, I checked out my now favorite bird identification web site (whatbird.com) and soon learned that my little visitors were western tanagers. This resource said they spend the winter in Mexico and Central America then migrate north for summer breeding. These guys must have been making a pit stop before traveling farther north. I hope I'm lucky enough to see them again next fall when the fly south. This last week was ruled by Murphy's Law - just about everything that could go wrong, did go wrong. It started with another altercation with Windows 7, which refuses to run one of my favorite and most used programs on the grounds of incompatibility. It's the program I use to design and print my pattern covers, and it's no longer being produced by Microsoft and therefore no updated versions of it are or ever will be available. If I upgrade to Windows 7 Pro (or whatever it's called) and add a virtual XP program, there's a chance my beloved old program will run, but there's also a chance that it won't. I'm pretty sure that Windows 7 is going to give me more gray hairs than I'd get raising a teenager for 6 or 7 years. I think my best bet will be to redesign my covers in another program, one that isn't owned by Microsoft and has a reputation for sticking around for a long, long, long time. I'd much rather use that time for other things, but we do what we have to do. If I do one redesign per week, I should be done in about a year or so - groan! Maybe I'd better try two per week. Meanwhile, I still have my funky old conputer with XP at my parents' house that I can use. May it live long and prosper! I won't bore you with the rest of my mishaps, but share something positive instead. A Yahoo group I subscribe to is doing a monthly challenge this year. This month's challenge is pieced braids. It's a technique I've wanted to try but never made the time to do so, so on Sunday afternoon I made time to try it. I think I've fallen in love! Lol! I pulled scraps from my scrap basket and had a nice looking braid going in minutes. I can see this as my go-to method for using up scraps from now on. My first braid is being used to make a small purse. On the second braid, I tried using only blue scraps. I don't know, yet, what it'll become. It's pretty but only 12" long (only 6" in the photo), so it might become trim on a tote bag, or a dog jacket, or perhaps an apron. Or ...? I began cutting fabrics on Monday. In the end, I let the fabrics sort of dictate which colorway to use - the black chalkboard fabric has to be the rectangles because chalkboards are rectangular! It's still Saturday here on the west coast, so I'm squeaking in under deadline even though most of you have called it a day and tucked yourself under a quilt. My dial-up internet service was being quite cranky today and disconnecting every 5-30 minutes. When your modem works at 24K, 5 minutes is barely enough time to even log on! Anyway, on to the project! Here's a shot of the novelty fabric I've chosen for this project. 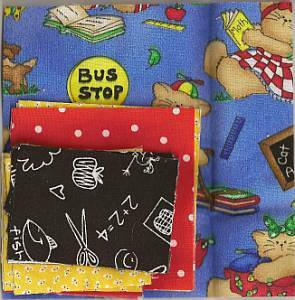 It's a kid print with bright primary colors which will be fun to work with. 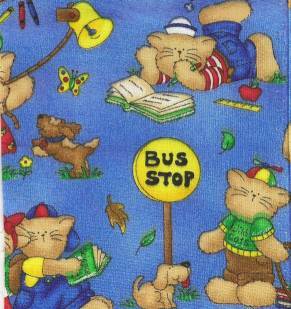 This fabric came in a pack of FQs and being a large print, the options for using it are rather few. With fussy-cutting, there's enough to get four 6.5" squares, but I've decided on a 1-block project: a large wall pocket for stashing diapers or bedside reading material or other treasures that clutter a kid's bed until mom or dad insists that they be put away. The copyright for my Chained Star block currently belongs to Quiltmaker so I can't give you instructions for making the block for at least another 6 months when the copyright returns to me. 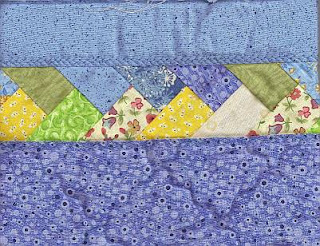 While we wait for the 100 Blocks issue to go on sale (May 10), I'll share some of my pre-sewing process with you. First, I pulled coordinating fabrics from my stash. I settled on a red with white dots, a yellow with tiny black and white butterflies (I think that's what they are) and a black with white "chalk" drawings. Next, I used Electric Quilt software to play with the colors, and I found even more ways to color this block! Oh my, it's going to be difficult choosing just one! Since children often think of stars as yellow or gold, I chose yellow for the star points in most of the colorways and I'll most likely choose one where the star really pops out, but isn't it interesting how a set of five shapes in one configuration can yield so many variations. A dozen blocks could easily be made with these four fabrics with each block being different. And even though they're different, the "chain" still links them all together. I love playing with designs! 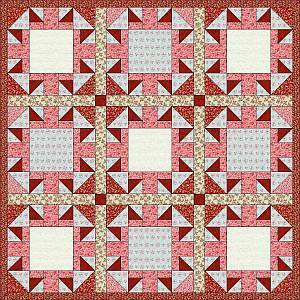 The lucky winners of Quiltmaker's 100 Blocks are Sandi P.and Becky. Both winners have been notified by e-mail. Thank you to everyone who left comments. It was so much fun reading them all. If I got that many comments for everything I posted, I could easily get addicted to blogging! I'll be back later today to post about a project using the Chained Star block. Scroll down to the previous two posts to learn more about my block and see it in different colorways. If you haven't checked out the blog tour, I encourage you to do so. You'll meet some great designers and get to see some of the creative blocks in volume 3 of 100 Blocks, which should be available in stores next week. But I have to warn you that once you see these great blocks, you'll want a copy of the magazine! I know that money is tight for many of us, but getting 100 original block designs for only $6.99 is quite a deal, I think. If you're feeling lucky, you just might win a copy of the magazine. 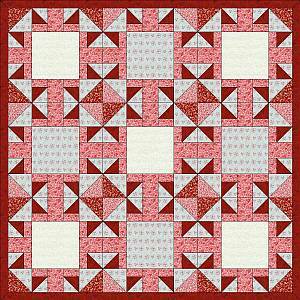 The Quiltmaker blog and every designer on the blog tour is having a drawing for a free copy of the magazine. 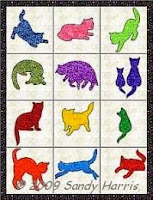 And Quiltmaker has drawings for other super prizes, too. Plus, I'm giving away a second copy of the magazine to one of you who comments on today's topic: What would you most likely put in the center square of my Chained Star block? A novelty print? 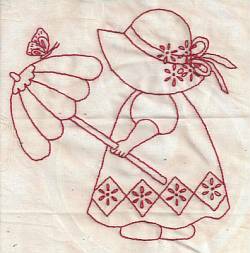 Embroidered block? 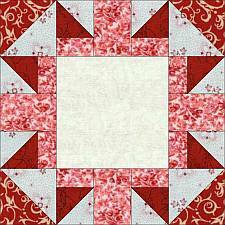 Applique block? Photo transfer? Hand-painted block? Something else that I haven't thought of? On Saturday, I'll post part 1 of the project I'm making with my Chained Star design. 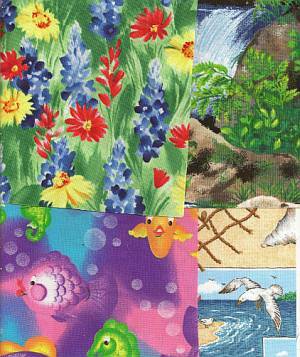 I was going through my stash of novelty fabrics for examples that could work with my Chained Star block and, except for the realistic animal prints, they were mostly bright colors. Maybe living in a rainy climate makes me gravitate toward bright fabrics. I'll be using a bright print later this week to demonstrate a small project using my Chained Star block, but I want to mention that applique and embroidered blocks also work well as centers for this block. 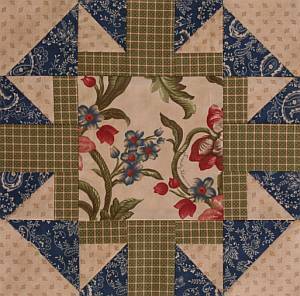 Do you see how the stars are "chained" together in this quilt? 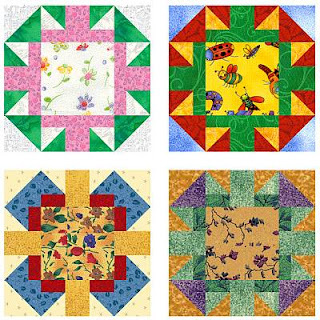 For instructions on entering a drawing to win a copy of Quiltmake's 100 Blocks magazine, scroll down to my previous blog post. I named it Chained Star - you will understand why when you begin playing with multiplle blocks! This is one of the blocks I designed to utilize 6.5" charms (unfinished size) of those great novelty and bold floral prints that are so difficult to cut into smaller pieces. 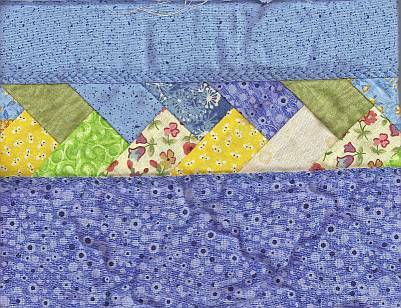 For the block above, I used leftovers from a layer cake pack that were sitting on my sewing table at the time. It doesn't look anything like the bright colors I usually work with in Electric Quilt when I play with designs! Below are some computer-generated blocks, in my more usual colors, that show other ways to color this block. In the bottom two, you can see how the "star" can pretty much vanish when the color placement is changed. They're all great designs, but I think I like the ones with the prominent star best. Which do you like best? 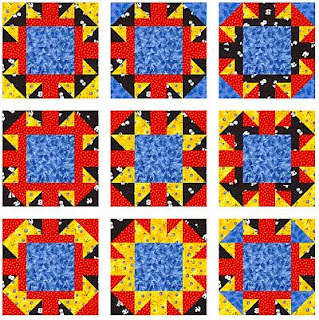 Leave a comment to this question for a chance to win a free issue of Quiltmaker's 100 Blocks, vol. 3! On May 7, a lucky winner will be chosen from all who reply.